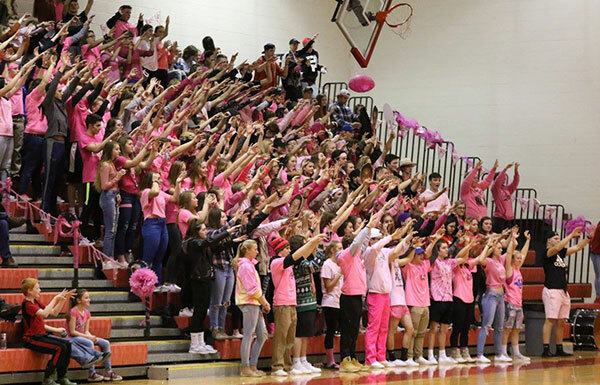 Tag Archive | "Athletic Leadership Council"
The Hawks Nest student section during the pink out game against Lowell last Friday, January 26. Photo by K&R Lalone. The Cedar Springs Red Hawks’ student section—the Hawks Nest—just barely missed making it as a top three finalist for MHSAA’s Battle of the Fans VII. But they are winners none-the-less. Cedar Springs was chosen as one of nine semi-finalists and one of three in Class A, on January 16. They then had 12 days to step up their game and show what they could do, and record it on social media. On January 23, almost 1,000 students cheered on a Special Olympics basketball game between Cedar Springs and Sparta—and they cheered for both sides. They also cheered at pink out games for girls and boys basketball. During last Friday’s pink out boys basketball game against Lowell, the positive spirit they showed made a big impact on at least one of the opposing team’s fans. Harnden said that sentiment really exemplies all that they have done this year. “There have been a large amount of great moments the past two sports seasons that are highlighted with one of the largest sections we have ever had for our Lowell football game, and partnering with the school Be Nice campaign for our Glow Out Bullying basketball game,” he said. 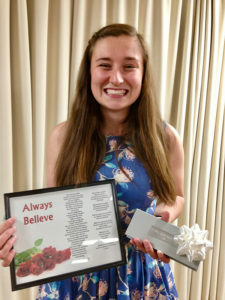 Harnden hopes the positive impact of the campaign extends beyond school walls. 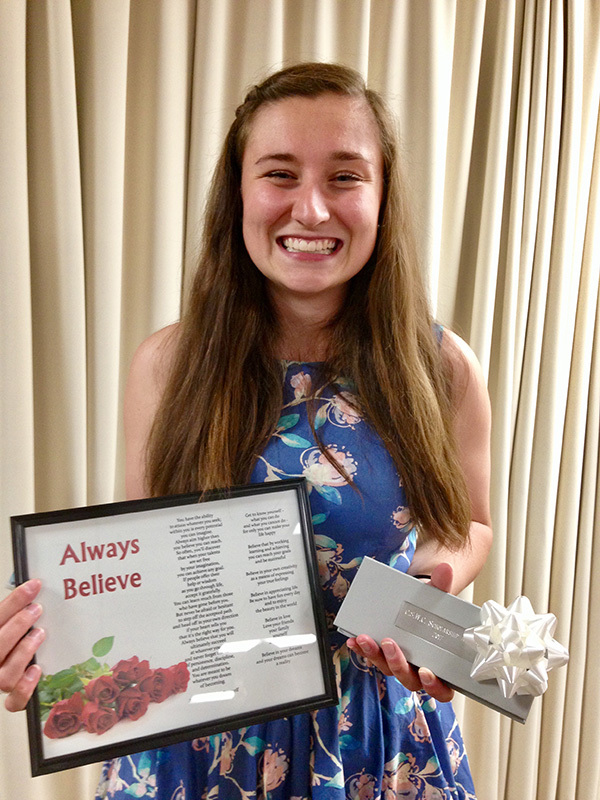 “I hope that the positive shift resonates with not just our students, but our community as well. Everyone leading and pushing in a supportive way makes the games so much fun to be a part of and when we can lead the shift out of the student section we can make a much bigger difference in the lives of many other people,” he explained. Boyne City, Buchanan and Petoskey were selected as finalists by MHSAA’s Student Advisory Council. Voting among the top five semifinalists was particularly close, according to the MHSAA. Cedar Springs and Charlotte just missed earning spots among the top three. Munising, Negaunee, Pellston and Traverse City West also were among the semifinalists. “This year semi-finalists; next year champions,” he said. Visit CedarSpringsTV on youtube.com to see several examples of the Hawks Nest in action during Battle of the Fans VII. 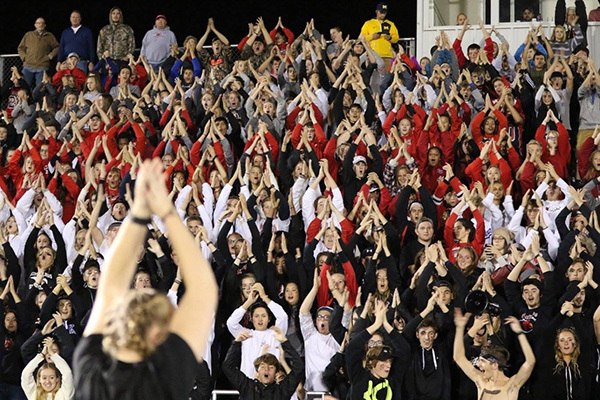 Cedar Springs is one of nine schools across the state competing to win the “Battle of the Fans.” Courtesy photo. Every athlete knows that there is a member of the team that doesn’t play on the field or court with them, but they are part of the team just the same—and that’s the fans that cheer them on. Anyone who has been to a Cedar Springs Red Hawks sporting event knows that the student section—the Hawks Nest—is one of the best around. And now the student section has a chance to prove it. Teacher and Coach Justin Harnden has been working with the Athletic Leadership Council at the school to create a culture that’s positive and supportive to all fans and teams—including the opposing ones. And Tuesday morning he saw some of the fruits of that labor when it was announced by the MHSAA that Cedar Springs was one of nine schools chosen to continue on to the semifinals in the “Battle of the Fans VII” contest. The Battle of the Fans was organized by the MHSAA staff and its 16-member Student Advisory Council. Schools were invited throughout the fall to submit short videos, via YouTube, of their cheering sections in action, with the deadline Jan. 13. Nine semifinalists were announced on Tuesday, January 16: Cedar Springs, Petoskey and Traverse City West from Class A; Boyne City, Buchanan and Charlotte from Class B; and Munising, Negaunee and Pellston from Class C/D. Instead of choosing five finalists as in past years, the Advisory Council selected nine semifinalists to accomplish a list of tasks showing off their sections over the next 12 days–and the Council will then select three finalists for MHSAA visits. This year’s winner will be announced Feb. 23 and recognized March 23 at the Breslin Center. Semifinalists are required to complete 10 challenges via their social media channels by 11 p.m. Jan. 27. Five mandatory challenges focus on contest criteria: positive sportsmanship, student body participation, school spirit, originality of cheers, organization of the group, student section leadership and overall fun. Five elective challenges (taken from a list of 15 opportunities) will allow semifinalists more opportunities to show the unique characteristics that make their sections elite. Harnden was pleased that they had been chosen to head on to the semifinals. “We have a lot of work to do, but we are up for it,” he said. A total of 19 schools applied for this year’s contest – seven from Class A schools, six from Class B, four from Class C and two from Class D. Three semifinalists each were selected from the Class A, Class B and Class C/D applicants. The Student Advisory Council will select the finalists for announcement Jan. 29 on Second Half. MHSAA staff and Student Advisory Council members will visit all three finalists for home basketball games during the second half of this regular season, with coverage and video from those visits and the announcement of the winner all to be published on Second Half. The winner will be selected by another Advisory Council vote based in part on activity on the MHSAA’s social media sites. All social media postings regarding Battle of the Fans VII should include the hashtag #BOTF. The MHSAA will share semifinalists’ challenge posts over the next two weeks on its Facebook, Twitter and Instagram sites and Snapchat feed. The MHSAA also will post from the three finalists visits on those channels. Cedar Springs will be using their social media sites on Facebook (CSHS Athletic Leadership Council) and Twitter (@CedarALC). Don’t forget to check them out and share their content! To see the application video they put together, go to YouTube and search for CedarSpringsTV. Click on it, and then you will see their “Battle of the Fans” video listed. Brison being pushed out on to the field during the event. Photo by K. Alvesteffer/R. LaLone. 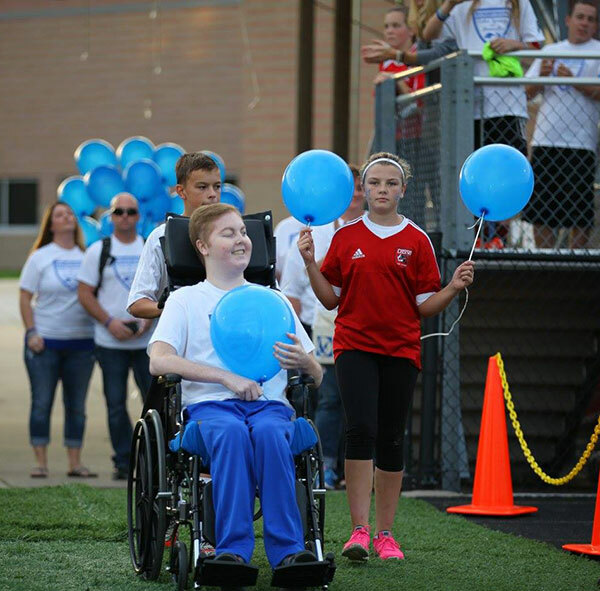 Brison Ricker smiles as he sees his teammates lined up holding signs that spell out Rickerstrong#one at Tuesday’s fundraising game between Greenville and Cedar Springs. Photo by K. Alvesteffer/R. LaLone. 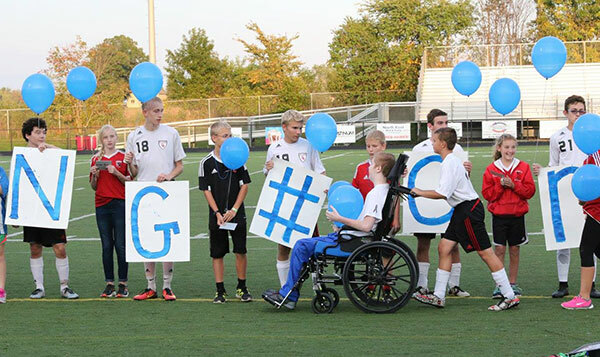 The Cedar Springs and Greenville Varsity Soccer teams might be rivals on the field, but they were teammates for a cause Tuesday evening, October 4, as they raised money for medical treatment for Cedar Springs teen Brison Ricker, who suffers from DIPG, an inoperable brain tumor. At this time last year, Brison was a freshman playing for the Varsity Red Hawks, and was voted offensive player of the year. He was diagnosed in January with the tumor. Both communities helped bring in donations and worked together to raise $4748.20 for the Ricker’s accumulating medical bills, which doesn’t include all the cans. “We also collected an astronomical number of cans that we will return soon to add to that total,” said Dreyer. She said she thinks it could be at least another $1,000. Brison’s medical bills for treatment are around $17,000 per month. Conventional treatments were not working, and his doctor felt there was nothing more they could do, so the Rickers sought out an alternative treatment for Brison, and he has seen improvement on the protocol. Dreyer said Coach Kyle Avink gave a touching speech after the national anthem on how cancer has affected every person in some way these days, that we all know someone who has battled, is currently fighting or lost their battle with cancer. Then after a moment of silence they had a balloon release in Brison’s honor. It was evident that Brison enjoyed the night. When the team lined up on the field with each holding a letter spelling out Rickerstrong #one, a big smile spread across his face. Kim said that Brison will have another MRI next week to see how well the treatment is working. She said that they also now have a couple of doctors helping with wound care. The steroids that he was taking tore his skin apart. If you’d like to help Brison heal and return to the soccer field, there are several opportunities coming up to do so. The next can drive held by Team Brison will be Monday, October 10, at Meijer in Cedar Springs. They are usually in the early evening. See the Team Brison Facebook page for details. Also, next Saturday, October 15, is a big event at Skinner Field from noon to 5 p.m.—a music festival with food, fun and games to help raise funds for Brison. 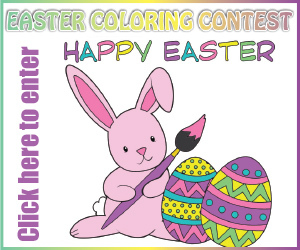 See page 2 for details, or check out the Team Brison facebook page. You can also make a direct donation by visiting Brison’s gofundme page at https://www.gofundme.com/brisonricker. Last Friday night’s Varsity game against Northview was the second annual pink game for Hawks against cancer. The fans turned out for this special night, to help honor both victims and survivors of breast cancer. The Athletic Leadership Council provided cotton candy, face painting, and glow stick necklaces. The football team wore pink jerseys, pink socks and put pink stickers on their helmets. The cheerleaders also wore pink jerseys. 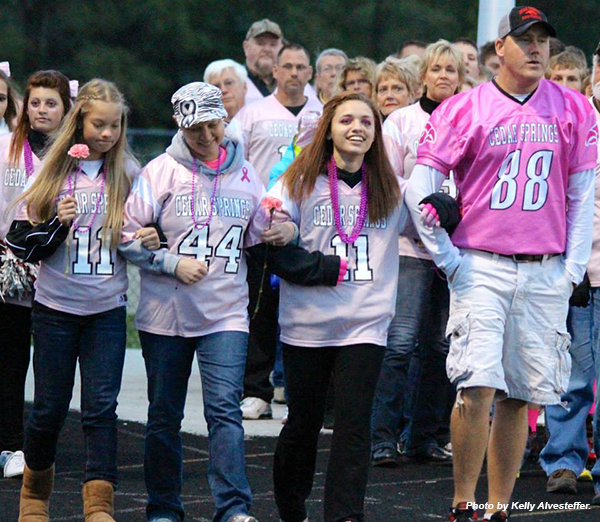 The football players and cheerleader’s sponsors were given pink jerseys too. All proceeds went to Gilda’s club.